I had mentioned the original SFG book back in my Products #4 post. Since then, a lot of people have asked for a little more information on history, and also there is always some confusion as to which book they have and particularly when I give a lecture all book owners bring their book to get it autographed. They don’t really know there are several versions of the book through the ages. The original book was published in 1981. That was a long time ago. I thought I would go through each new version of the book and show you what the covers looked like and describe a little bit about each one. Why it had a new cover or new contents, etc. I put together all of my ideas, wrote an index and a sample chapter and started researching for publishers. I picked Rodale Press, who published the Organic Gardening Magazine which I followed, and one other publisher who was nearby the metropolitan area and published magazines and books that were more mechanical and technical in nature. I made appointments, visited them, presented and went home hopeful to hear from them. They were both very receptive and enthusiastic, and they both agreed to offer a publishing contract. I picked Rodale because they seemed more in tune with my method of gardening and also were already in that same business and had published quite a few gardening books. The contract was signed, they assigned an editor to me and off we went! It took nine months to write the book. I always joke that’s the same amount of time to have a baby! I wrote every day, did a lot of research and trial gardening to perfect the method, created a perfect display garden (which they photographed) and worked my way through the whole book, including all of the charts and diagrams. It was a wonderful project and although I had a very difficult schedule, I enjoyed it immensely and was very pleased with the results. I had a little bit of trouble with the assigned editor from Rodale, because she had only grown bush beans in a window box previously. Her reasoning was that she was there to correct the english, spelling and sentence structure and only knew traditional gardening, so she caused me a lot of pain in explaining the new system and getting it correctly written the way I wanted it. I won’t tell you her name because I don’t even remember it and don’t want to get any one in trouble, besides. Rodale sent out their photographer and chief editor, we filmed the garden and everything went well. They designed the cover which I highly approved of and after a short period of time, the book was published. Perhaps the first inkling of future problems was that they put a price tag on it of $9.95, while the rest of the market was over $10 and I objected to no avail that the price should be much higher. As it turned out, they realized this within three months after it was first published. When it hit the market, it sold like crazy and they realized they had underpriced it. There is a whole story, maybe even a chapter in a book, about the promotion, publicity and marketing of the book. First, by the publisher, which equaled zero. Second, by the author, which ended up in my own PBS-TV show. Suffice it to say that the book was a huge success. I was very proud of it, including the cover and all of the contents. Letters came streaming in, affirming that it was a wonderful new system and it really worked. Saved time, effort, money and mostly was simple and easy. It required very little knowledge that beginners had to learn and understand. Fast forward. The TV show was a huge success and ended up on every PBS station in the country. That’s another whole chapter in my life’s history, but suffice it to say I felt it was time for a new cover and especially a new back cover. Rodale agreed to do it if I would design it and lay it out. My oldest son, Stephen, was the producer of my TV show and we worked together to create a new cover and a better marketed back cover. Nothing was changed inside. Same method, same text – same everything. Just the two covers and the price were different, increasing from $11.95 to $16.95. Everything went well and it continued to sell, even though I had taken the show off the air and retired once again. The next change in the original book wasn’t until 2005 and I’ll tell you all about that on my next blog. 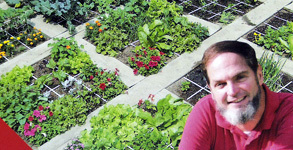 Hi Mel, I read the Small Space Gardening in Feb/Mar 2012 issue of Mother Earth News. Your book and John Jeavons’ book were prominently mentioned. I have to agree; both were great influences on my gardening path. BTW: Installing 8 boxes this Spring on drip in Orem, UT this Spring. I’m going to try coco peat in my mix. I’ll let you know how it works out. Thanks so much for your letter. It’s great to hear that you are taking SFG so seriously and installing 8 boxes and I wish you the best of luck in that endeavor. If you want, you can send me some pictures of your garden once it’s planted and looking beautiful to askmelsfg@gmail.com. I’d love to maybe feature them on my blog sometime or even on http://www.squarefootgardening.com. Also, let me know how the coco peat works out for you – it’s not Mel’s Mix but I would be interested in the results. My mom let me borrow your book which is the original from 1981. I’m curious how much has changed in the contents of the 2005 version? Do I need to go out and get a copy, or will the original version suffice? I am curious to know when your mother bought the original book and what does the cover look like? Was I standing up in the garden or was I kneeling down in the garden? This would indicate which version of the book she got. They are all the same on the inside, but the covers were different. Now, as to your question yes. YES, you do need the ALL NEW book, which is actually the 2007 version of the book, not the 2005. It’s got ten new improvements to the original book. The original went more into the philosophy of Square Foot Gardening. The new book goes more into the design, building, construction and operation of the garden. It’s all color and there is lots of beautiful pictures for the how-to section. It will give you a lot more information. The first book is good reading, I must admit, but the ALL NEW version is much better especially for a beginner. What you might do is you can order the book right from our website, here is a link to it. All of the profits go to our SFG Foundation for humanitarian and educational projects rather than to somebody in a big company. So, we would appreciate that, Although you can buy it in any bookstore, because it is the largest selling gardening book in America. What you might also consider, Tim, after you read it if you get your garden started you could loan it to your mother just like she loaned you the original. Thanks again for writing. Good luck with your new garden. Hopefully, it will be the ALL NEW garden! I just find out about your SFG and I love the idea. I never plant anything in my life and I would like to start my own vegetable garden in my backyad using SFG so I wanted to buy your book but I found out you have a second edition, which one should I get the original first edition or the second? Knowing that I don’t know anything about SFG and would like to learn as much as I can. Thank you so much for your time and I look forward to working on my garden this spring. If you can wait just a short while, the second edition will be ready within a week or two to be on the market. The Publisher decided that we needed an update of the original 2007 version of the ALL NEW SFG book, which of course had ten major changes in the original method book from 1981. So this new, second edition, of the ALL NEW method book, includes some new sections on both children and family gardens, as well as more on pest control. This new second edition will not outdate or make the ALL NEW SFG book obsolete, but provides additional useful information. If you’re in a big hurry, I would get the ALL NEW book or, if you can wait, get the second edition for the most updated version. I hope that’s not too confusing, but it shows how long Square Foot Gardening has been around and how we are always striving to improve the system to make it easier to understand and use. Frankly, compared to old fashioned row gardening and all of the other newer bed gardening, SFG makes it so simple and easy to understand, especially for the beginner. It’s also a lot easier to be productive because it takes only 20% of the space, 10% of the water (that’s a big deal today!) and 5% of the seeds with only 2% of the work, 1% of the tools and NO WEEDS in SFG. No other method here or abroad could ever make that claim. So you are buying the right book. We just have to make sure you get the right and latest edition. Good luck and remember to start small. Read the entire book before you start. Best wishes.